This year's opportunity quilt is called Jewel of the Sea. It was constructed with love by our members. We placed every piece with an eye for creating primary and secondary patterns. Look for the stars, circles, and ribbons. The longer you look, the more patterns and movement you'll see. 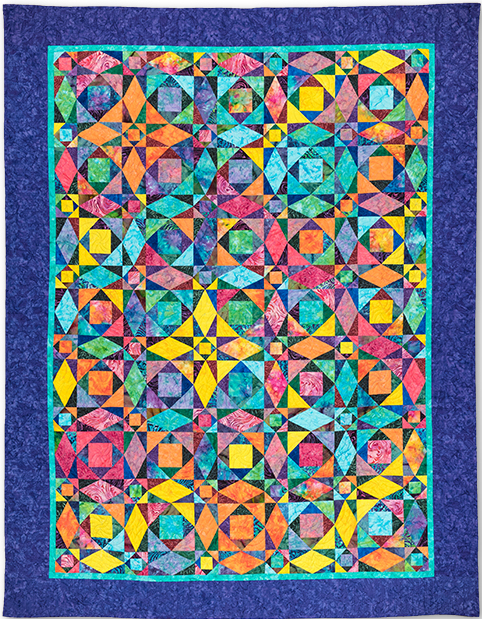 The quilt was based on a design by John Flynn and quilted by Cecilia Hosford. Hens & Chickens Quilt Fellowship is now in its 28th year as an auxiliary of Golden West Foundation. Each year the members create an opportunity quilt. These quilted works of art have raised money that has funded scholarships plus contributions to campus projects such as theater renovations, new library books, a Fine Arts gallery security system, Child Care rugs and toys, repairs in the chemistry lab, and a brick entryway for the GWC California Native Plant Garden.